The Talmud is the great repository of the Jewish rabbinic tradition. The most prominent collection originated in ‘Babylonia’ (Mesopotamia) in the fourth and fifth centuries CE, but a second, less voluminous collection was compiled in Palestine, the so-called Palestinian or Jerusalem Talmud. The first edition was printed in Venice in 1523-1524 by Daniel van Bomberghen from Antwerp, more commonly known as Daniel Bomberg, who was active in Venice between 1511 and 1538. This codex in two volumes, Leiden Or. 4720, is the only surviving manuscript that was used by Bomberg for his edition, and indeed the only complete manuscript of the text to have come down to us at all. 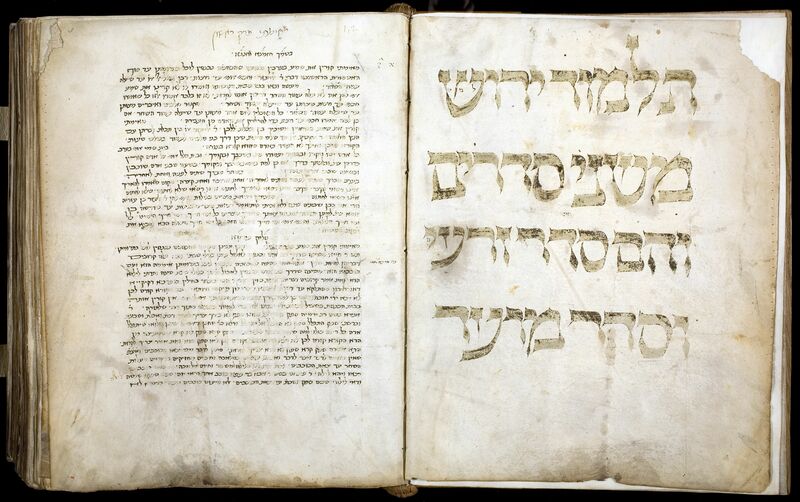 Written on parchment and dated in the year 5049 of the Jewish calendar (1289 CE), it was made by the copyist and scholar Jechiel ben Jekutiel ha-Rofe, most probably in Rome. In the mid-sixteenth century the manuscript was bought from Bomberg by the French ambassador and bibliophile Jean Hurault de Boistailler, who paid twelve gold pieces for his prize. After his death it passed into the hands of the famous humanist scholar Josephus Justus Scaliger, who moved from his native France to Leiden in 1593 and died there in 1609. It now rests among Scaliger’s bequest of Oriental manuscripts and books.